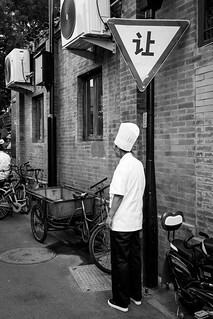 When it is still to early for diner, the restaurant chef can enjoy a break in the street... always more interesting than in front of a TV or setting somewhere playing with a mobile phone. In the Gulou Hutong, there is always plenty things to discover daily, even in front of your door... This is China.